An exhibition of new work by Amy Fleming, The Age of Experience: We Tell Better Stories, is coming to the Claude Pepper Museum at the Claude Pepper Center, 636 West Call Street, Tallahassee, on the campus of Florida State University. The exhibition runs from December 1, 2017, to January 19, 2018, with an opening reception December 1, 6 – 9 p.m. The exhibition is funded by a grant from Puffin Foundation Ltd. The Puffin Foundation provides grants to artists whose work addresses social issues, or who may be excluded from mainstream opportunities due to race, gender, or social philosophy. This exhibition works to change the narrative around the way we discuss aging by focusing attention on the many vibrant members of our elder community. Ageism is a byproduct of a hyperconsumerist mindset: the disposability of mass-produced goods, the replacement of “old” with “new” without regard to quality or continued usefulness feeds into this attitude. In The Age of Experience: We Tell Better Stories, images of mass-produced discards find new life as impossible robes and royal collars made from pump valves and vacuum tubes, pull tab rings reappear as chain mail, soda bottles form crowns and halos. Amy has been working with members of the City of Tallahassee Senior Center to create a series of screen and relief printed portraits. Participants in the project range in age from 60 to their mid 90’s. She became interested in problems facing older adults when two family members were dismissed from their jobs when they entered their 60’s despite having excellent work records. One is still having difficulty finding full-time employment. Amy Fleming is an Adjunct Professor of Printmaking and Print Lab Manager at Florida State University. She is the recipient of a grant from Puffin Foundation Ltd., a Robert Rauschenberg/Barrier Island Group for the Arts award, has been an Associate Artist at the Atlantic Center for the Arts artists residency, Artist in Residence at 621 Gallery and a Summer River Fellows Program resident artist at Columbus State University in Columbus, Georgia. Her work is included in public and private collections including the Jean and Alexander Heard Library at Vanderbilt University, and the Southern Graphics Council International permanent collection at Kennesaw State University. For more information on the exhibition, please contact Amy Fleming at ajfleming@fsu.edu and visit her website at www.amyflemingstudio.com. The Claude Pepper Center Museum is open Monday through Friday, 9 a.m. To 5 p.m.
For holiday closing information, please check http://claudepeppercenter.fsu.edu/contact/. As an exhibit planning group, we decided on the words representing the main functions of the digital library: discovery, scholarship and engagement. We also as a group decided on the raw ingredients that made those functions go: materials, community and system. My colleague working on the visualization with me originally suggested some sort of web visual, which would show the interconnectedness of the ingredients and functions. 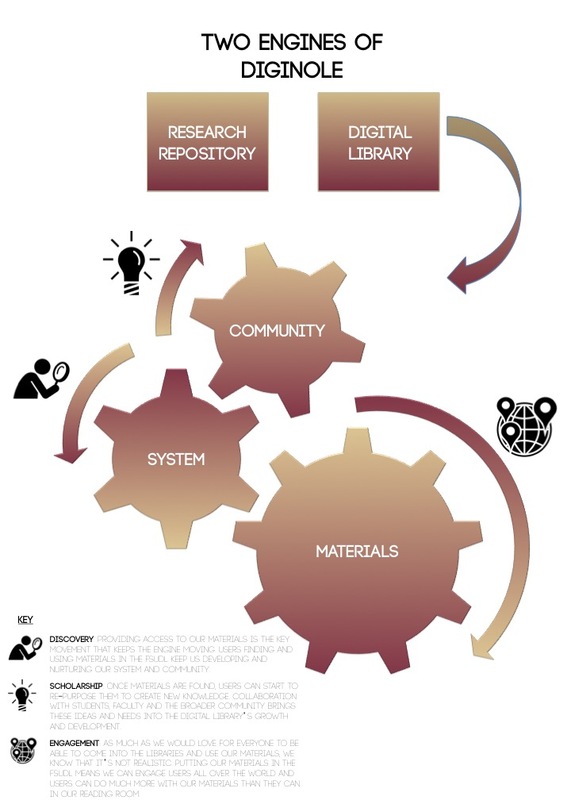 However, while that solved one problem (showing how the digital library works), it didn’t quite show how it worked in the bigger context of DigiNole, the platform that also held the Research Repository. I kept playing around with the idea of engines, which eventually led me to the final graphic of cogs and functionality as the motion moving the cogs. The digital library was only one engine of DigiNole so the Research Repository could be represented as a part of the greater machine in which the digital library moved. From there, I assigned each ingredient to a cog of the machine and then named the movements after the different functionality we wanted to highlight. It was clean, simple and did its job in illustrating a highly conceptual idea in a straightforward manner for the exhibit without lots of text and using vocabulary that our intended audience (non-librarians) wouldn’t understand. Hopefully it succeeded! 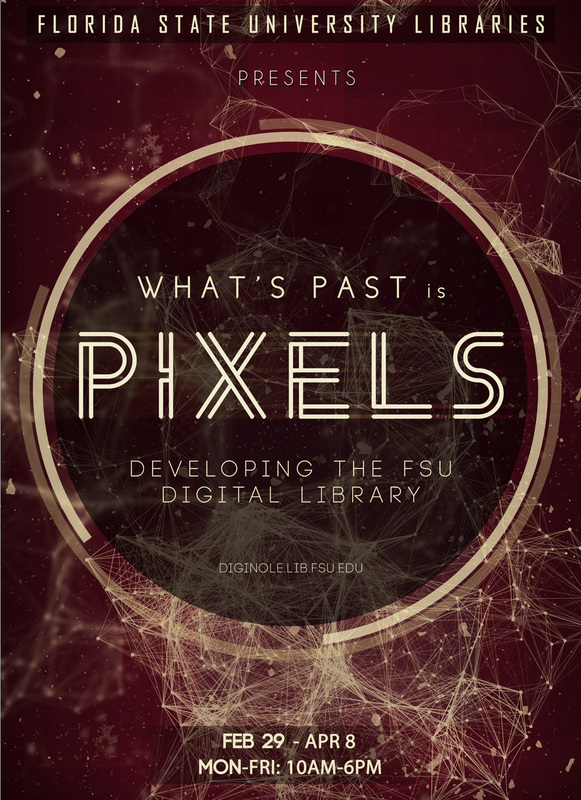 What’s Past is Pixels: Developing the FSU Digital Library is located in the Strozier Library Exhibit Room and is open 10am to 6pm, Monday through Thursday, 10am to 5:30pm Friday. It will be held until April 8, 2016. As a digital archivist, when I’m working with exhibits, they are usually of the digital variety. However, when we wanted to make a splash for the launch of DigiNole: FSU’s Digital Repository which combines the digital library with the research repository, we knew we needed to do something a bit bold, a bit crazy and very impressive. For over 10 years Florida State University Libraries has hosted a digital library in some form or another. In that time technology has evolved, changing how we can interact with physical objects in a digital space. 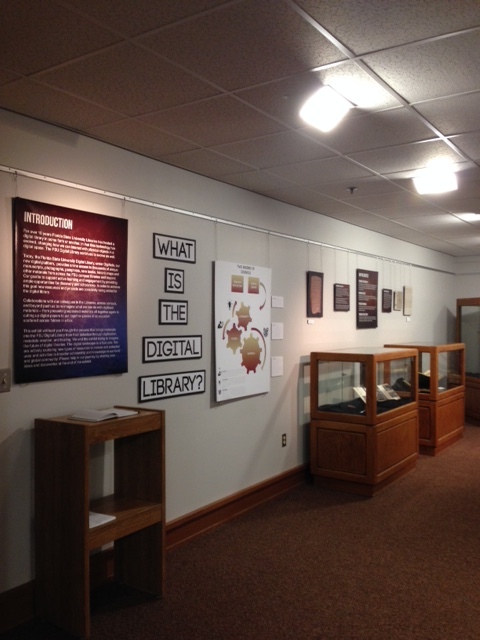 The FSU Digital Library continues to evolve as well. Today, the Florida State University Digital Library, under DigiNole, our new digital platform, provides online access to thousands of unique manuscripts, photographs, pamphlets, rare books, historic maps and other materials from across the FSU campus libraries and beyond. Our goal is to support active learning and engagement by providing ample opportunities for discovery and scholarship. In order to achieve this goal new resources and projects are constantly being added to the digital library. The exhibit takes you through the process of materials being selected, digitized, and described before they find their way into DigiNole. It then explores the new uses for materials that can occur in the digital environment and what the future may hold for the development of DigiNole over time. We’re having some Opening Day festivities today for the new exhibit. A Coffee Talk at 10am, Cake (!) from 12-1pm and then a Closing Reception from 3-4pm. Also throughout the day, there will be demonstrations of DigiNole and what you can find and do with our materials. What’s Past is Pixels: Developing the FSU Digital Library is located in the Strozier Library Exhibit Room and is open 10am to 4pm, Monday through Friday. It will be held from February 29 until April 8, 2016.